Site Equips anti vandal cabin 16 foot is the larger anti vandal cabin that we offer, it offers flexibility and security to any site. This size cabin is suitable for up to 10 people working on site. This anti vandal cabin 16 foot is a towable unit and is able to reduce transport costs as it does not require HIAB delivery. This also means that we can deliver to remote sites. Our anti vandal cabin 16 foot is available in 12 foot and 16 foot. Please call our friendly sales team on 0800 371 994 for more information. Site Equip can deliver this unit next day or as and when needed. 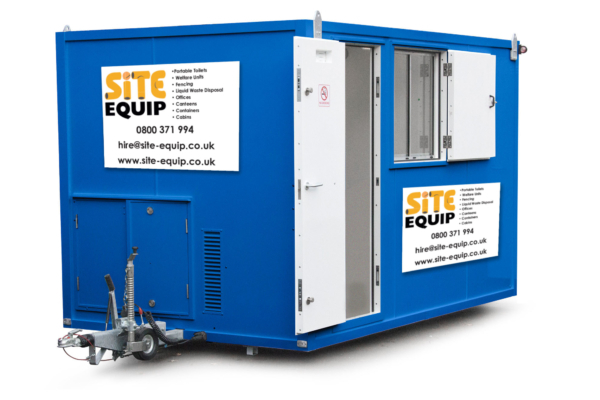 Site Equip can deliver cabins across the South East of England, including Hampshire, Surrey, Kent, West Sussex, East Sussex, London, Essex, Buckinghamshire, Oxfordshire and surrounding areas.